From left to right: No trigger humps, single hump, and double humps. This post includes data from a FB post by ‎Martin Ivie. The main text is mostly his words. 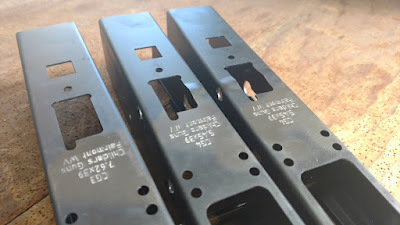 We have included a table to display what we have learned about Trigger Humps in AK stamped receivers. When the Russians switched from the AK47 Type 3 to the AKM they introduced a bolt bounce retarder as part of the trigger group. People often refer to this as a rate reducer, and it does reduce the cyclic rate ever so slightly in full auto mode, however this was not its original design purpose. The reasoning behind the bolt bounce retarder has to do with the lighter weight and greater flexibility of the stamped receiver versus the milled receiver. The Russians found that with the lighter more flexible receiver of the AKM occasionally the bolt carrier would bounce back enough to cause the bolt to be slightly out of battery when the hammer was release by the auto-sear. This caused a variety of problems up to and including catastrophic failures. The retarder delays the hammer fall just slightly (milliseconds) after the auto-sear is tripped so that this does not occur. Correct nomenclature based on translation of Soviet manuals is bolt bounce retarder or retarder for short – not rate reducer. The bottom on the retarder for an AKM is flat. The AKM fire control group (FCG) does not have a roll pin to hold the disconnector and spring and retarder and spring in place during assembly. There is a slave pin in the cleaning kit that does this and is poked out by the axis pin during assembly. Anyone who has ever installed this style trigger group with the retarder knows what a pain this can be. As part of the improvements during the design of the AK74, a roll pin was added to the trigger assembly to hold the trigger, disconnector and spring, and retarder and spring together as a unit which could easily be dropped in the receiver. The axis pin is then passed through the roll pin. In doing this the holes through the trigger assembly components were all enlarged for the roll pin so the same diameter axis pin could still be used. The earliest AK74s had flat bottom receivers just like the AKMs. The retarder for early AK74 was made by drilling out an AKM retarder for the roll pin. When this was done, the bottom of the hole actually broke through the bottom of the retarder leaving a gap. This gap was found to collect crud and cause the retarder to not function properly. To eliminate this problem, material was added to the bottom of the retarder and a dimple or bump was made in the bottom of the receiver on the right hand side of the trigger opening. Later, for ease of making the stamping/forming dies, the dimple/bump was made to go across the full width of the bottom of the receiver. The dimple/bump on the left side of the trigger has no function other than ease of manufacturing. Single bump receivers were used on Russian AK74’s and Russian AKS74U’s up to mid-1987. Russian Ak74’s and AKS74U’s post mid-1987, AK74M’s AK100 Series, and Saigas all use double bump receivers. East German AK74 rifles used single bump receivers. Romanian AK74’s all used double bump receivers to the best of my knowledge. In addition, a wide variety of Romanian AK’s in all calibers sold in the US have double trigger bumps. These are obviously not the original military design used for the Romanian military AKM’s as can be seen from the fire control groups and trigger guards with receiver stubs from the Romanian AKM kits. The receivers for import Romanian rifles without trigger bumps are therefore coveted by collectors for rebuilding these kits.